The weather in Almaty is the best in Kazakhstan. ...always bring your own sunshine. Remember "bad weather in Almaty" always looks worse through a window. By the way don't worry if this image is dark. It means Almaty is in deep sleep and you are in a totally different time zone from Almaty. To get the right local time you need to add +6 to Greenwich time. That's in winter. In summer you add +5 to GMT as Kazakhstan had stopped observing DST since 2005. Press on the image to see the weather details and forecast. I'll wait just here. Don't wander away though. Remember you are just checking the weather and I've got more tips for you. If you are planning a trip to Almaty and you are one of those people who cannot stand the heat, then you need to miss out July and August. 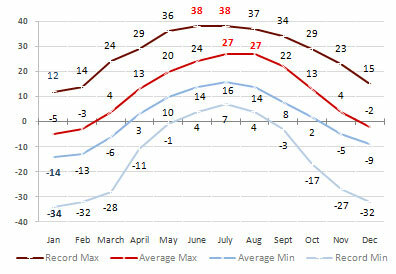 July record high in this chart only shows +38C, some days it feels hotter though. You can neither stay in or go out, day and night, unless you had air conditioning. 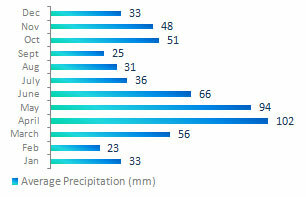 This chart shows the Almaty yearly averages for rain and snowfall in mm. 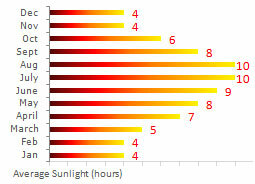 While this one shows the Almaty average sunlight hours. Anyway summer or winter, if the weather is not right for you there is always a place to escape. The beautiful mountains. Yes, just like the ones in this picture, Courtesy of dennis.rutseikov. I know people who don't like winter for snow and dull days. 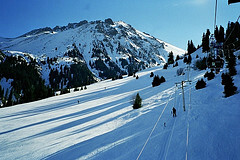 But you will love Almaty even in winter. Well, I hope so. The sun in winter gets even brighter and clearer with the white snow covered pine tree mountains in the background. Courtesy of straightfromthecask. from the desert climate zone. Some years more than the others the Steppe lets you know that it's still there. Winter 2007 was one of those years. If a normal year you would use three buckets of coal a day to heat your country house, in 2007 you had to double, sometimes triple that amount just to get it a kind of warmish. And it lasted months, before it eased down. That's when you wish you were living in the city to enjoy the comfort of the soviet central heating system. I am getting sidetracked again. You are here for the weather in Almaty. The weather in Almaty varies quite a lot from place to place. It is the location of Almaty stretching from 650m to 1500m altitude that causes this difference. 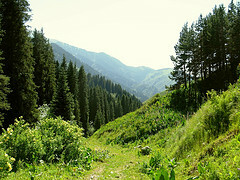 If you are in Almaty in spring simply follow the blossom of apples, apricots or cherries. Start from the lower areas and move upwards. You will notice at least a weeks delay of spring between the areas. I am chatting away about the weather in Almaty, but do you know where Almaty actually is. No? Then let me get my Google boots on. Phew. Ready. Now let's have a virtual trip with this Google interactive map of Kazakhstan. Or would you better check the Kazakhstan Weather or the Kazakhstan Climate or else return from the Weather in Almaty to the Guide to Kazakhstan home page? I leave you here to decide.